The 2013 season is the last of the BCS era, an experiment that began in 1998 and proceeded to enrage nearly every college football fan along the way. Despite the flaws in the process, the underlying awesomeness of college football shined through time and time again, gifting us memorable games, plays and athletes over the last decade and a half. Over the course of the week, we’re going to present you with the BCS Top 50, the best plays, players, storylines and games of the BCS era. Yes, there is another season of football still to be played, but the BCS will be buried and forgotten without ceremony at the conclusion of this season. This is our chance to honor it while it still lives. There was an attempt to be as thorough as possible with opinions coming from a host of different college football fans, but there will probably be something you thought definitely needed to be on the list that won’t appear. We’ll have a whole post at the end of the week where you can vent about the best stuff that was left off. We’re looking forward to that – seriously. Nebraska quarterback Eric Crouch probably doesn’t get the respect he deserves due to the way his career ended, with two blowout losses (including one to the 2001 Hurricanes, perhaps the best team ever assembled) and a lack of NFL success. But Crouch was really, really good in college, guiding the Huskers to a 31-5 record as a starter after taking over before the third game of his sophomore year. He won the 2001 Heisman and Walter Camp awards, and also had two of the era’s signature plays. Nebraska held on to win the game against their old rival, but an upset loss to Colorado at the end of the season denied them an appearance in the Big 12 title game. Few series have seen the upper hand in the rivalry shift quite like Stanford and USC. In 2007, the No. 2 Trojans were a 41-point favorite over the winless Cardinal. The game was in the Coliseum, where Southern Cal was riding a 35-game winning streak. To make matters even worse, the Cardinal had to start their backup quarterback, Tavita Pritchard. USC had lost six games the previous four seasons combined, while Stanford had lost 13 of their last 14. Somehow, the long shot came through. John David Booty threw four interceptions on the night, helping the Cardinal rally from a 23-14 fourth quarter deficit. On their go-ahead drive, Pritchard had to convert a fourth and 20 from the USC 29 before coming through with another fourth-down conversion, this one a touchdown pass from the 10-yard-line to Mark Bradford. After another Booty interception, the Cardinal ran out the clock for a completely improbable 24-23 victory. It was Jim Harbaugh’s first season as head coach in Palo Alto. Just two years later, the Cardinal returned to the Coliseum and destroyed the Trojans 55-21. Toby Gerhart ran for 178 yards and 3 touchdowns as Southern Cal suffered their worst loss under Pete Carroll and their worst home loss since 1966. Due to Harbaugh’s, uh, unwillingness to call of the dogs, the Cardinal scored 4 touchdowns in the fourth quarter. After the game, Carroll went up to the Stanford coach and asked a vague but fair question: “What’s your deal?”. The Thundering Herd dropped the game, but Leftwich recovered to help them win the MAC Championship a month later, throwing for 404 yards and 4 touchdowns in a 49-45 win against Toledo. The Herd went on to win the GMAC Bowl against Louisville, clinching a 10-2 record. We would be remiss to mention Leftwich and not discuss one of the most ridiculous bowl games ever played. In the 2001 GMAC Bowl, Leftwich went against his future NFL teammate David Garrard and East Carolina. The Pirates led 38-8 at the half, and anyone who turned the game off missed a ridiculous performance by Leftwich, who led a furious Herd comeback and ended up with 576 yards passing, 4 touchdown throws and a 64-61 double overtime win. And, oh yeah, because we live in an amazing world, the whole game is available on YouTube. Kellen Moore’s Boise State career is remarkable, as he accumulated a record of 50-3 over four years of starting. What’s even more remarkable is that he probably should have been 52-1 with three consecutive trips to the BCS. In 2010, Boise was ranked fourth in the country and carried a 10-0 record into Nevada, where the 19th ranked Wolf Pack and Colin Kaepernick waited to play a de facto Mountain West title game. The Broncos led the entire game, but a Kaepernick touchdown pass tied it at 31 with 13 seconds remaining. The game looked like it was headed to overtime when Moore found his favorite target, Titus Young, on a 54-yard bomb to get inside the 10-yard line, setting up a chip-shot field goal for the win with a second remaining on the clock. The Reno crowd was stunned as Boise kicker Kyle Brotzman lined up for the 26-yarder … but he missed. Barely. I’m still not 100% sure he didn’t make it, but you can judge for yourself on the replay. The game plunged into overtime, where Brotzman missed another attempt – this one from 29 yards – leaving the door open for Nevada kicker Anthony Martinez’s 34-yard game winner. Nevada claimed the Mountain West title and denied Boise a trip to the BCS. Fast forward to 2011. Boise State is 8-0, fifth in the nation and hosting a 7-2 TCU team. The Horned Frogs trailed 35-28 in the fourth quarter, but Casey Pachall connected on his fifth touchdown throw of the game to bring TCU within one. Gary Patterson decided to eschew the possibility of overtime and rolled the dice, his team successfully completing a two-point conversion to go up 36-35 with 1:05 remaining. Again Kellen Moore put on a great drive and again he set up his kicker (this time freshman Dan Goodale) for a game-winning field goal and again the kick missed, sailing right. That ended Boise’s absurd 65-game home win streak, and for the second year in a row, Moore and the Broncos fell just short of a conference title and BCS berth. Texas' presence in the 2005 Rose Bowl was a close call, and still a sore subject with California fans. Some last-minute politicking by Mack Brown (which he denies, but come on) helped the Longhorns jump the Golden Bears in the final BCS standings, sending them to Pasadena to take on the Wolverines. Lloyd Carr brought a loaded offense in, and freshman quarterback Chad Henne didn’t disappoint, tossing four touchdown passes, three of them to Braylon Edwards who was all over the place (ten catches for 109 yards). Michigan took a 31-21 lead into the fourth quarter. And then the nation, with the stage all his, got introduced to Vince Young. The Texas quarterback threw for one touchdown on the afternoon but ran for four more, as helpless Michigan defenders wondered what this thing was they were trying to tackle and why he just wouldn’t go down. A pair of scoring scrambles got the Horns a 35-34 lead, but the Wolverines weren’t done. A beautiful Steve Breaston return helped set up Michigan kicker Garrett Rivas for a go-ahead field goal, and it was 37-35 with 3:04 remaining. That was too much time. In what was probably the biggest game ever played in Lubbock, 2008 saw No. 1 Texas traveling to take on No. 7 Texas Tech, both teams sitting at 8-0 with dreams of Big 12 and national titles. The Red Raiders jumped out to a 19-0 lead (including a safety on the very first play of the game), but Texas seniors Colt McCoy (two touchdown passes to Malcolm Williams) and Jordan Shipley (a 45-yard punt return) kept the Horns in it, eventually taking the lead on a short touchdown run by Vondrell Mcgee with 1:29 remaining. This result unleashed unholy chaos on the Big 12, which saw Texas, Texas Tech and Oklahoma all finish 11-1 (7-1 in conference), with Tech’s only loss coming to Oklahoma and the Sooners’ only loss coming to the Horns. The Big 12’s tiebreak deferred to the BCS standings, which resulted in Oklahoma going on to play in the Big 12 title game, where they dispatched Missouri, before moving on to lose to Florida for the BCS championship. Texas won a fun Fiesta Bowl over Ohio State while Texas Tech lost the Cotton Bowl to Ole Miss. Crabtree, in addition to making the biggest catch in Red Raider history, went on to win his second consecutive Biletnikoff Award. When people write the obituaries of the Bowl Championship Series, I hope they take the time to acknowledge what Utah did in showing the flaws in the system. If a team wins all of the games put in front of it, it should at least get to play for the national championship, and twice the Utes were denied that opportunity. Utah went undefeated twice, and their lack of crystal trophies for fielding two great teams showed that something had to change. 2004’s team was barely threatened over the course of the season, their smallest margin of victory standing at 17. Along the way they laid waste to a trio of middling BCS conference teams (Arizona, North Carolina and Texas A&M), but instead of going against undefeated Auburn – as Oklahoma and USC played for the BCS title in Miami – Utah was shipped out to the desert to play Pittsburgh, an underwhelming Big East champion. Crafty thinking by those in charge of protecting the BCS: If Utah won the Fiesta Bowl, it wouldn’t mean anything because the Panthers were only ranked 19th, and if they lost, it would invalidate the rest of their season. The Utes dominated 35-7, Urban Meyer left to coach at Florida and Alex Smith became the number one overall pick in the NFL draft. In 2008, Utah’s margins of victories in the regular season weren’t as wide, but they claimed a few more impressive scalps (at a down Michigan team, wins over top 15 BYU and TCU squads). This time the Utes got a shot at one of the big boys, as they traveled to take on 12-1 Alabama in the Sugar Bowl. The Tide watched the Mountain West interlopers leap out to a 21-0 lead in SEC country, and while Nick Saban’s crew managed to get it to 21-17 early in the third, the Utes shut them out the rest of the way en route to a 31-17 victory and 13-0 season. Even without a trophy, the 2004 and 2008 Utah teams put together two of the most impressive runs of the BCS era. Conference championship games are a relatively new invention, with the SEC’s version debuting in 1992. Sometimes the game would contain one national championship contender, needing to avoid a final loss to punch its ticket to the BCS title game. But on a few blessed occasions, the championship games have served as de facto playoff matchups, with both teams in the top three, ensuring the winner a place in the BCS championship. In 2008, Alabama carried the No. 1 ranking into the game against No. 2 Florida. It was a back-and-forth affair for most of the evening, with Tim Tebow’s three touchdown passes countering scoring runs from Glen Coffee and Mark Ingram. A Leigh Tiffin field goal gave the Tide a 20-17 lead going at the end of the third quarter, but they would score no more. Two long touchdown drives by the Gators chewed up most of the clock, with the only two Bama possessions in the period ending with a three-and-out and a Joe Haden interception. Florida won the game 31-20 and went on to defeat Oklahoma for the BCS title. In 2009, it was undefeated Florida carrying the No. 1 mantle into the game against the second-ranked and undefeated Tide. Alabama got vengeance with a suffocating second half, carrying a 19-13 halftime lead into a 32-13 victory. Mark Ingram won the Heisman that night, turning in 118 yards and three touchdowns, while all Alabama fans got their desktop wallpaper for the rest of eternity: Tebow crying in the waning moments of the game, score plastered across the top. The Tide went on to defeat Texas for the BCS title. In 2012, No. 2 Alabama and No. 3 Georgia squared off for a spot opposite Notre Dame in the BCS title game. The Bulldogs returned a block field goal for a touchdown in the third quarter to take a 21-10 lead, but their defense had no answer for Eddie Lacy and T.J. Yeldon, who guided the Bama ground game to 350 yards rushing. A.J. McCarron found Amari Cooper for the go-ahead touchdown, but they left 3:05 on the clock for Aaron Murray to work. The Bulldogs' quarterback - bashed by some for his struggles in big games - was brilliant on the final drive, slicing and dicing the vaunted Tide defense to reach their 8-yard-line with 13 seconds left. In one of the cruelest endings imaginable, Georgia receiver Chris Conley caught a deflected pass and was tackled at the five. With no timeouts remaining, Mark Richt’s Bulldogs could only watch as time ran out and Bama celebrated. Nick Saban’s team would go on to defeat Notre Dame for their second consecutive BCS title. Three plays later, Dyer took a third down handoff down to the 1-yard line, setting up a short Wes Byrum field goal for “all the Tostitos.” The Auburn kicker came through as time expired, clinching the Tigers’ first title since 1957. Dyer finished the game with 143 yards, but the young back left the Plains following his sophomore season, during which he was indefinitely suspended for violating team rules. With a 10:15 p.m. 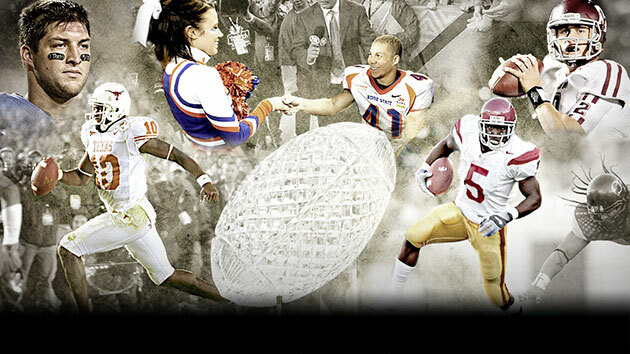 ET kickoff, 2005’s match up of 10-0 USC and 8-1 Fresno State was the perfect nightcap for college football fans. The Trojans were riding a 32-game win streak into the game and eyeing their third straight national championship, but Pat Hill’s Bulldogs were not intimidated. The visiting WAC power briefly held a fourth-quarter lead, but was done in by two things in a heartbreaking 50-42 loss: turnovers (the Bulldogs had five) and Reggie Bush. Here are the full highlights of the ridiculous shootout.